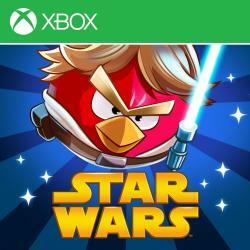 Join an epic adventure with the Angry Birds in the legendary Star Wars� universe, re-mastered for gaming systems! Use the Force, wield your Lightsaber, and blast away Pigtroopers on an intergalactic journey from the deserts of Tatooine to the depths of the Pig Star -- where you�ll face off against the terrifying Darth Vader, Dark Lord of the Pigs! Can you become a Jedi Master and restore freedom to the galaxy? May the birds be with you! � TWO NEW MULTIPLAYER MODES � Competitive (2-4 players) and cooperative modes (2 players) � EXCLUSIVE NEW LEVELS � 20 levels created just for the console game � 25 HOURS OF ENGAGING GAMEPLAY � Use Lightsabers and Jedi powers to wreak havoc on Imperial pigs and the dark side of the Force in over 200 levels � UNLOCK HIDDEN ITEMS - Unlock the R2-D2 and C-3PO bonus levels and bonus content The downloadable version of this game supports English, French, Italian, German, Spanish, Portuguese.